Highly accurate location information is a key attribute to stimulate future technologies in commercial and public service sectors. State-of-the-art technologies take usage of preexisting infrastructure, e.g. wireless access points or satellites to circumvent performance degradation caused by harsh multipath propagation. To achieve high levels of accuracy and robustness, a high number of available access points is necessary. In this PhD research project, the radio channel is analyzed to exploit position-related information contained in the radio-channel which can be obtained for positioning. Previous research paid attention to estimation of channel parameters, incorporation of cooperation among nodes as well as the concept of cognitive networks. These approaches are further investigated and their applicability is ascertained by analysis of experimental data. 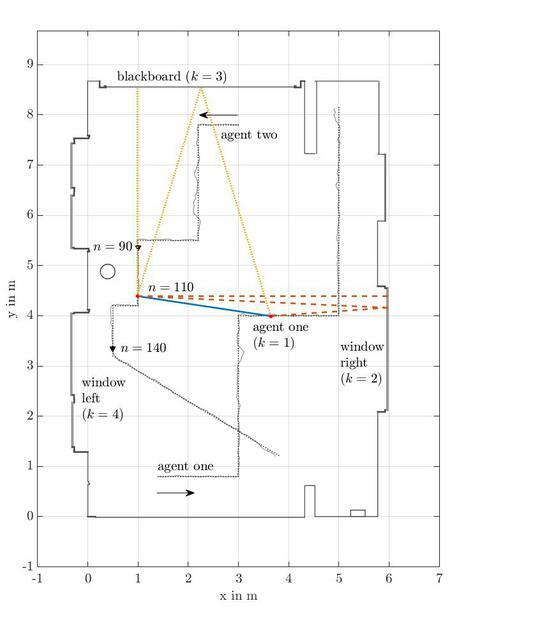 The figure shown below illustrates positioning of two cooperating nodes in an indoor scenario. The algorithm takes usage of multipath propagation to track both nodes' positions without using information obtained from preexisting infrastructure.